Devolved powersharing in Northern Ireland is being put at risk by vanity-motivated politicians refusing to compromise on minor issues, the Alliance Party has warned. Leader Naomi Long said sticking points preventing a deal to save the institutions paled in comparison to the major obstacles overcome during the peace process. She said it was "ludicrous" that disputes over "relatively small" points now threatened to undo the hard-fought gains of the past. Noting the potential of yet another snap election if negotiations again fail, she claimed some political rivals were more interested in trying to secure one or two extra seats at the polls than focusing on what is best for Northern Ireland. "What we have here is far too precious to simply squander because of vanity projects of individual parties," she said. "If we do not restore devolution we have lost this project. "We have invested in this over my entire lifetime to get from where we were in the early 1970s to where we are now. "You do not throw that away lightly - you certainly don't do it over what are relatively minor differences." Mrs Long said she did not believe an agreement would be reached by the Good Friday deadline. She did however call on other parties to start rebuilding trust to enable some sort of pact to be struck in the weeks ahead. Her warning came as business leaders gathered at Stormont to demand a return to devolution. The Democratic Unionists and Sinn Fein - the two parties whose agreement is essential if a new coalition executive is to be formed - are at loggerheads over a series of issues. The Alliance Party, SDLP, Ulster Unionists and UK and Irish Governments are also involved in the talks. The main stumbling blocks are legislative protections for Irish language speakers; how to deal with the toxic legacy of the Troubles; a stalled Northern Ireland-specific Bill of Rights and agreeing a joint approach to the Brexit negotiations. Mrs Long said progress had been made on all the outstanding issues, but not enough to get a deal over the line. She said the sticking points were far from insurmountable. "It is the depth of mistrust and lack of respect between parties that is the bigger barrier," she said. Devolution crashed in January over a row about a botched green energy scheme. The subsequent snap election campaign laid bare the other disputes dividing the DUP and Sinn Fein. Sinn Fein insists the key to progress is implementing integral parts of previous agreements. The republican party accuses the DUP and UK Government of failing to honour obligations in that respect. The DUP, however, claims what Sinn Fein is asking for represents new and unreasonable demands. 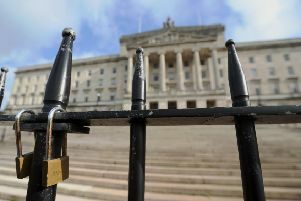 Northern Ireland Secretary of State James Brokenshire instigated the two-week talks process after last month's negotiations to form a new powersharing administration ended in failure. Parties missed a deadline to get a government up and running within three weeks of March's Assembly election. Mr Brokenshire has made clear he will start formulating legislative steps to either restore devolution or make the first moves toward direct rule over the Easter weekend - meaning Good Friday is set to be make or break for a deal. Earlier on Tuesday, representatives from business and civic society journeyed to Stormont to deliver an open letter to Parliament Buildings calling on politicians to put aside their differences. The letter said stable government was needed to guarantee peace, attract investment, deliver job creation and advance social progress.